Featuring a unique and sturdy circular silhouette, Sunpan’s Jakarta Dining Table adds an element of easygoing elegance in the modern motif. Crafted of quality wood in a lush espresso hue, the Jakarta Dining Table by Sunpan offers visual and textural appeal with its meticulous etched artisanship. Topped with tempered glass, Sunpan’s Jakarta Dining Table provides durability while also allowing for all manner of seating styles. Sold as part of the Ikon collection. Black round tempered glass top is both practical and elegant. Etched base crafted from solid espresso wood delivers outstanding support. 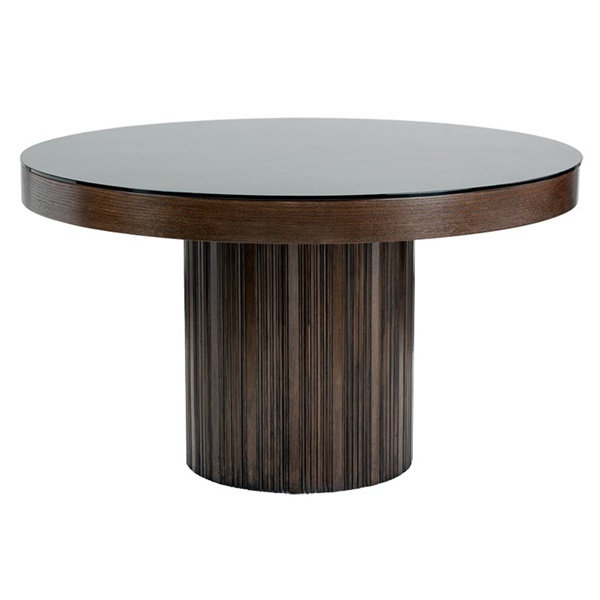 Clean, transitional design enables the table to complement the décor in a modern or traditional setting.